Summer in India takes its toll on everyone, causing discomfort and ruining moods. The struggle is not just limited to outdoor chores under the scorching sun, but also takes place inside our houses where without air coolers or conditioners, or in the event of a small power cut, the intolerable heat is sufficient to wipe out our day. Below are some helpful tips to make your house heatproof when the temperature starts soaring. Starting with the simplest tip, it has been discovered that around 35% of the unwanted heat comes from our window openings. 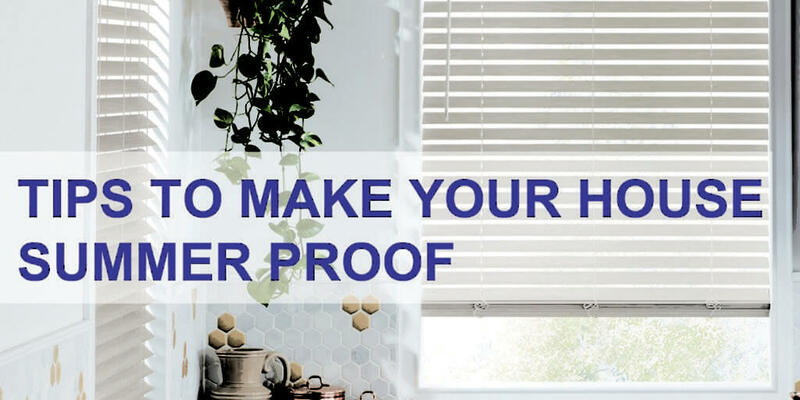 You can experiment with different window covering options in different categories like awnings, shades, blinds and curtains, depending on your requirements for different areas. Reflective films are also a good option to consider, because of their great potential for up to 70% heat reflection. Have you ever thought about switching to CFLs (Compact Fluorescent Lamps) or LEDs (Light Emitting Diodes)? Well, then this is the time you pay attention because those incandescent lights you may be using effuse about 85% of the energy in the form of heat thus creating a warmer atmosphere in the room, in addition to contributing to high electricity bills. So it is best to avoid this radiation by replacing them with highly efficient CFLs & LEDs. Eradicate unwanted heat by making sure there’s proper cross ventilation in your house. In cross ventilation you keep your windows open on the opposite sides of your house during early mornings and late evenings which helps in minimizing the stockpiling of moisture, odour and other gases by creating air movement which improves the comfort level within the house. You can also use exhaust fans/ chimneys in your kitchen. This may take a little while and a bit of planning but for the most effective temperature moderation, planting some heat tolerant trees like acacia, crapemyrtle etc. on the south and west side of your property will definitely be a great idea. A tree in its prime can block about 60 – 70 percent solar radiation penetrating your house. In addition to this, you can also opt for indoor plants like peace lilies, golden pothos etc. as they give out oxygen, providing you with better air quality and a healthy environment. As the rooftop of our buildings is exposed to the flaming sunlight, it heats up and due to the dense nature of concrete, it radiates the retained heat into the rooms. But don’t worry, various insulation materials are here to rescue. – Use weatherproof clay panels, their three tube-like holes help to avoid heat transfer. It is laid over the concrete roof with cement mortar. You can also use lightweight foam concrete panels in a similar manner. -Providing a 30-40 mm layer of gravel (railway jelly) can be an effective measure in restricting the transfer of heat. -Paint the roof with lime, as it reflects a great amount of heat. -A terrace garden is also a good option. Apart from the above-mentioned measures, you can also consider painting the walls of your home with a light colour, replacing filters of your air conditioner, unplugging electronic devices when not in use etc.